Fusing lights with technology, reintroducing fiber optics, using motion sensors and color changing LEDs, are a few of the modern lighting ideas we can see around today. Here we have highlighted some of the best ideas and styles we have found. 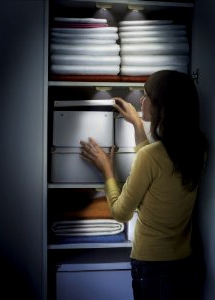 Motion sensor lights help save on wasted energy. Before they were popular for outdoor security lights, but now they are making their way into homes. We talk more about them in our Conserving Energy with Wireless Motion Sensor Lights and Adapters post. These are ideal for stairwells, closet lighting, or under cabinet kitchen lighting. In our ‘Stairwell Lighting Ideas’ post we highlighted a DIY project that involves motion sensors that will turn on the stair lights, slowly one by one. Fiber optics are making their way back into different lighting fixtures. 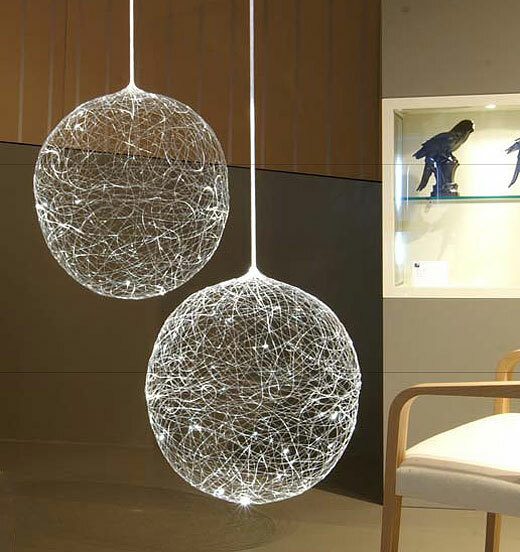 Here is a post on the Laluna – Fiber Optic Pendant Light – we have also highlighted a home theater ceiling that uses fiber optics to create a sky of constellations – L&L Design Guide: DIY Lighting Ideas and Projects. People are experimenting with fiber optics and putting them into concrete slabs for kitchen countertops, bar counters, or even walls. Bringing as much natural lighting into a home is a good choice for lighting design – all the while managing privacy and heat. Our post here explains a number of ideas around this: L&L Design Guide: Different Ways to Add Natural Lighting in Homes – From Windows to Solar Tubes. One of the ideas we talked about was the invention of solar tubes. These tubes are fitted into the roof and bring light down into the top floor of the house. They are ideal for hallways and walk in closets. They can also have lights fitted around the tube, so at night they can still be used. When it comes to modern style lighting for ceilings in homes, recessed lights are the way to go. These lights are fitted into a false ceiling, so all the parts are hidden, creating a sleek and clean look in a room – Home Lighting Ideas: From The Living Room To The Bedroom, The Kitchen To The Outdoors. Modern mood lights have been redesigned to include remote controls and LED lights. These days they have touch sensitive controls, and hundreds of thousands of colors to choose from. They can be set to one color, or set to cycle through the colors. So if it is gray and cold outside, splash the walls with green or yellow light. Or use deep blue or purple light to set a romantic setting. Choices in lights include ones like the Yantouch Jellyfish and the Philips Mood Lighting Collection which are stand alone units. Or there are special LED light bulbs that will screw into any normal light socket (in the ceiling or in a lamp) and can be controlled via remote. Cove Lighting – Requires construction work, but results in an elegant looking space. Light Shape – Bathroom tiles that have floral designs that light up. Nissoku Lamp – Design inspired by solar eclipses. Tunto Lamp – A wooden lamp with touch sensitive controls and a base that lets you charge your electronic devices wirelessly. Wallpaper Lights – A concept design that integrates lighting into wallpaper. The best place to look for tropical lighting and décor inspiration is over on the island of Bali. Traditional Balinese homes follow the main design principle of bringing the outdoors indoors. So you see a lot of wide open indoor spaces, with large windows that open out to the outdoors. This principle can also be used when looking for tropical home décor ideas. Bringing the outdoors indoors is also done through using natural materials (wood, stone, greenery, flowers) when looking at light fixtures, furniture, and décor pieces. When it comes to lighting, the first area to look into is natural lighting. This means opening up the house during the day by using large windows. Wooden blinds or bamboo shades can be used to add that tropical touch and privacy. When night falls, tropical homes become cozy and intimate places, a contrast to the open and airy space during the day. One reason for this is because of the lighting. Unlike modern homes that have lots of recessed lights that brightly light up the entire room, tropical homes use lights that are closer to the ground (which creates this intimate feeling). A lot of the tropical home in Bali won’t be using ceiling lights, as most ceilings are bare roofs made out of wood and are decorative structures. Instead, these homes will make use of wall lights such as sconces or wall washers, and floor or table lamps. If they do happen to use ceiling lights, they are generally pendant lights or hanging lanterns. When looking for tropical lighting fixtures, lights that are made of natural materials will work best. For example, lamps that have a wooden or stone base, or a wooden lamp shade, or even just a lamp shade that has a wooden frame but uses fabric to cover it up. The same design style also works when looking for tropical lights for the ceilings, walls or for outdoor lighting. You can use lighting to highlight certain objects or areas within a room to create focal points and showcase the tropical style you’ve built. Indoor house plants can have little display lamps shined onto them. If you place the lamp below the plant and shine it against a wall, it will cast unique shadows across the room. You can highlight a table of wooden or stone sculptures with light. Downlights can shine down onto a textured stone or wooden wall or onto a tropical wall decor piece. Another décor piece to have is a water feature of some sort – adding another natural element to a home. This can be a simple plug in bamboo fountain. Whatever it is, this water feature can also be highlighted by lighting it up. 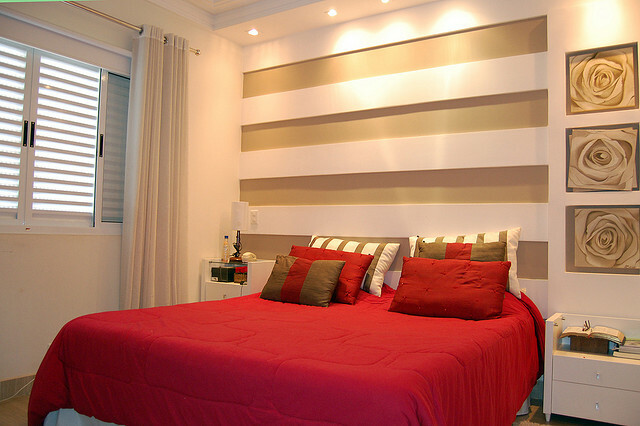 The dominant colors in a tropically styled home are browns (wooden furniture, sculptures, wall carvings, etc. ), greens (plants) and whites (furniture cushions, bed sheets, etc). 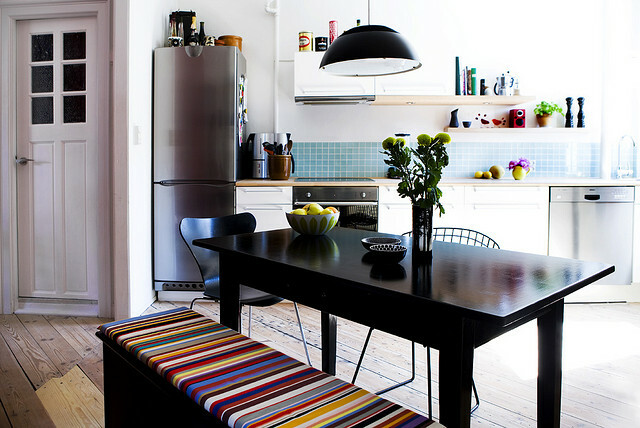 Flowers are what add splashes of color to these spaces. Tropical Furniture: Wicker or rattan pieces are ideal as they are lightweight and airy. Teak is another type of furniture that will fit into a tropical styled home – and as it can be waterproofed, you can find furniture pieces, like a shower bench, that can be placed in the bathroom. Bamboo is another great natural material to include in your tropical interior design. Bamboo furniture, mats, or picture frames are some simple ideas. Other Décor Pieces: Wooden or stone bowls can be used to group clutter on a coffee table or they can be used as bathroom décor pieces like as soap dishes, etc. There are also wooden or stone vases that can be used to house flowers which add a splash of color to any room. An outdoor space can be turned into one of the most intimate and secluded areas of the home. When it comes to lighting, you want to keep it low down and somewhat dim. Fire based lighting works best: candles, lanterns, fire bowls or tiki torches. 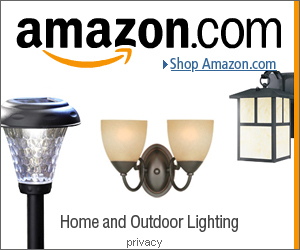 Click here for other outdoor lighting ideas. Light has a powerful effect on people – bright areas can energize the mind while dim lights can be cozy and romantic. Cool colored lights (blue and purple) are calm and relaxing, while warm lights (orange and yellow) invigorate. Instead of spending a lot of money on paint and furniture to transform a space, try the following home mood lighting ideas. Create a relaxing space by avoiding overhead lighting. 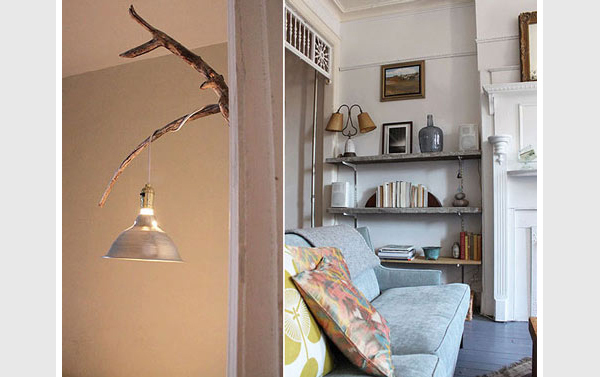 Instead, use table or floor lamps to illuminate a room. You can use light to focus attention on relaxing spaces. For example, a backlit headboard emphasizes rest by highlighting the bed. In a similar fashion, placing two table lamps or sconces on either side of a bed frame accent the room’s purpose. For a dramatic and tranquil effect, back-light nightstands using recessed colored lighting. Blue or cool colored lights can create accent walls without painting or wallpaper. 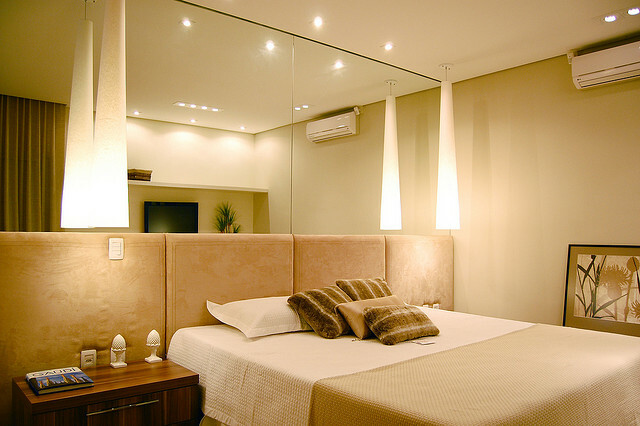 Lighting can promote a relaxing atmosphere in a bedroom. However, mood lighting ideas can be used in other areas of the home as well. Highlighting sculptural elements or indoor plants creates an intriguing play of light and shadows in a romantic space. Low light in combination with graphic shadows, evoke elements of mystery and intimacy. 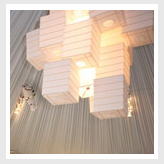 Paper lanterns serve a dual purpose, functioning as both a light source and sculptural focal point. For a similar effect in a living room, use lights to draw attention to bookshelves or paintings. 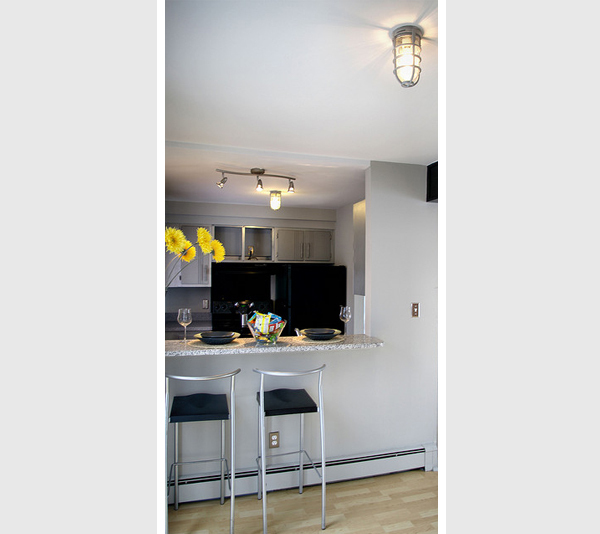 Light fixtures designed to hang over a picture can be used to light a room and highlight artistic focal points. Combining low lights with dramatic focal points creates a tranquil and relaxing living area. The calm mood is perfect for reading, enjoying drinks, or soft conversation. The bathroom is a great place to use romantic mood lighting. Candles are one way to create a romantic atmosphere. Candles can be used to line the lip of a bath tub or a bathroom vanity. Alternatively, led candles or free-standing lights create an intimate atmosphere as well as actual flame. Mood lighting is not only for indoor spaces. Porches, decks and patios can also benefit from a few well place mood lighting ideas. For example, lighting bright tiki torches at each corner of a patio can add drama and excitement to an outdoor space. String-lights can create a magical atmosphere over an outdoor deck or eating area. Remember, lighting has a powerful effect on the human mind. Mood lighting ideas can transform a space for little or no extra coast. Demonstrate originality and style by using spotlights to highlight art, plants or other focal points. Backlighting specific elements in a room can emphasize the room’s purpose while adding interest and drama to an otherwise blank wall. 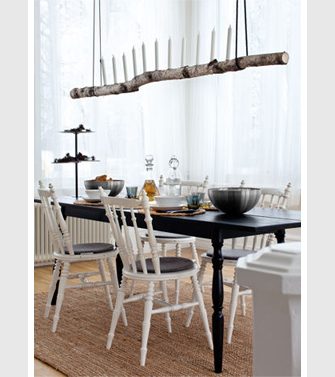 A few well place light fixtures can add drama or tranquility to a space.